Aswan is the southernmost city in Egypt. It was also known Swenet, Gate of Egypt. It is situated 129 km. south of Luxor and 899 km from Cairo. It has a population of about 220, 000 inhabitants. The ancient Egyptians noticed that the sun in Aswan did not shadow at the longest time and outlined the northern tropical latitude. A little later with the help of modern tools it was set a little further south. At the far end of the town is the Aswan dam and the sight of so much water in the middle of the desert is really impressive. The dam is 550 km long and at its widest part reaches 35km. Despite the coolness of the water the sun here is so strong that it is unlikely that you can endure more than half an hour without seeking shade. 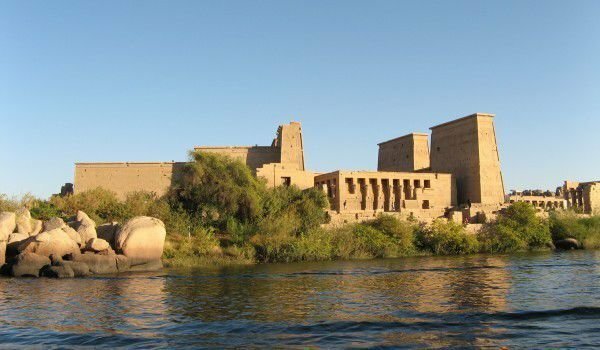 By motor boat, tourists can reach the island of Philae, where you will find the magnificent temple of Isis, where can be found a Christian altar in an Egyptian temple. Isis was the goddess of love and life and is carved in the shape of a mother breastfeeding her son Horus. The place is charming with peace and harmony that radiates. In 1964 UNESCO initiated the largest rescue in the history of archaeology. Due to the possibility of high floods after the first dam wall, 35 villages and 150, 000 people were evacuated, mainly to Kom Ombo and Abu Simbel north of Aswan. In 1998 Abu Simbel was opened as Nubian Museum, containing the statue of Ramses III, which is one of the biggest tourist attractions. The town itself is besides, the most attractive scenic riverside road in Egypt. Impressesive with its marvelous walking paths and beautiful views of nearby islands, studded with palm trees. Some have compared this place to the French Riviera. Because of the huge influx of foreigners Aswan has a new riverfront promenade with a port, where steamers berth, before sailing up the Nile. Places that should not miss if you decide to visit this southern Egyptian city, are market Moyen-el-Suk, Aswan Dam Museum and an unforgettable experience is a visit the Cultural Centre where you will enjoy exotic Nubian dancers.